When George Jones asked the musical question, "who's gonna fill their shoes? ", very often the answer involved folks like Daryle Singletary. 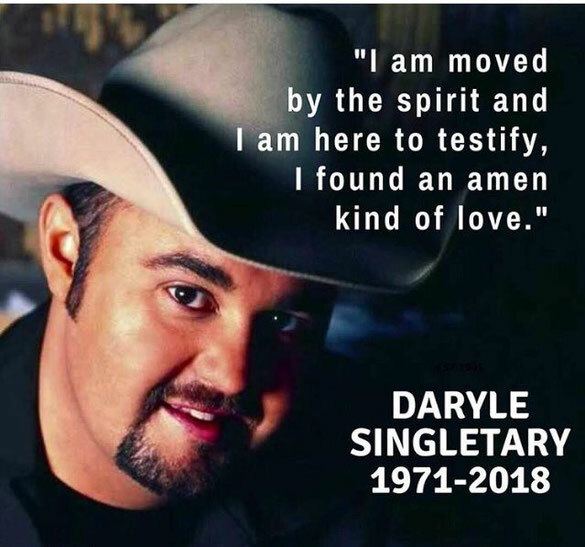 But when Daryle passed away, it left some hard questions - who's gonna fill his shoes? As such, this week's episode is entitled: the "Who's Gonna Fill Their Shoes: Daryle Singletary" edition - we're here to prove traditional country is in good and capable hands in 2018. We've got six singers Daryle's age or younger who are carrying on the tradition, including the Singletary-esque tones of Kevin Moon, Brian Mallery and Korey Rose; the originality of Matt Prater; the suave but hard country sounds of Tim Culpepper and the singing Louisiana lawman Clifton Brown. Take a listen to this week's show: you're going to feel reassured and upbeat after having done so. Traditional country music is in good hands - Daryle Singletary would agree. PS. I'm no good at photoshopping.